If you know me at all, you know that with papercrafts, I love dots and stripes. They are two basics which are easy to add to any theme! I have this thing about cardmaking. I’ll only use scraps of paper or papers I wouldn’t use for my own scrapbooking. Well this falls into the second category. The papers are these high gloss ones that have crazy prints on the other side that have always turned me off. 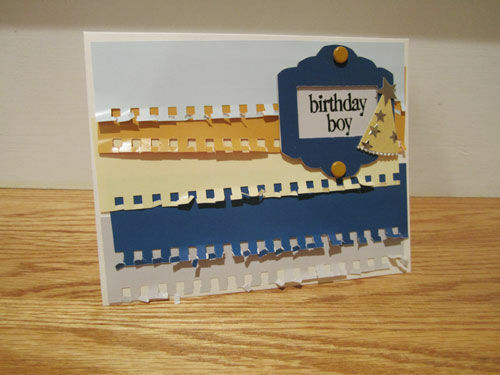 But for this Trigger Tuesday, the colors worked great to create a simple striped card. Hop over and play along!